Jaggery syrup - To pour over vishu katta before serving. Cook rice along with thin extract of coconut milk. 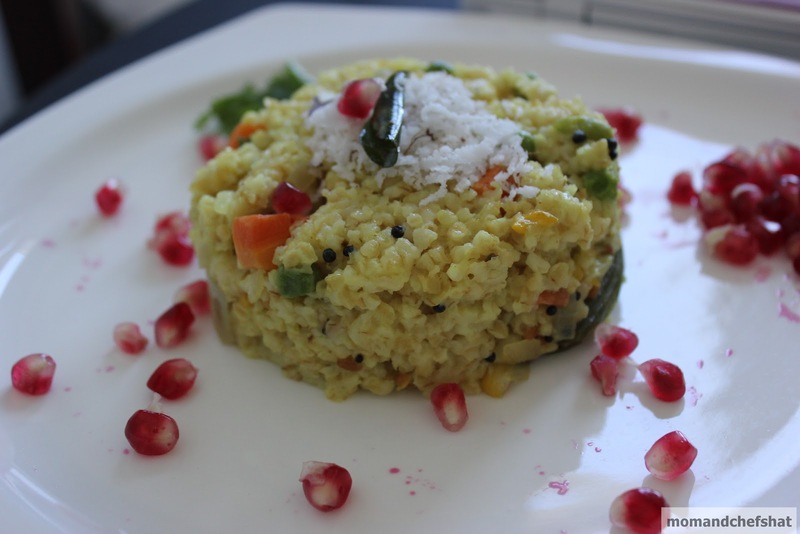 When the rice is half cooked, add thick extract of coconut milk, cumin seeds and salt. When the rice is cooked and coconut milk is all absorbed. Remove it from stove and spread it on to a greased plate. Leave it for sometime to set. 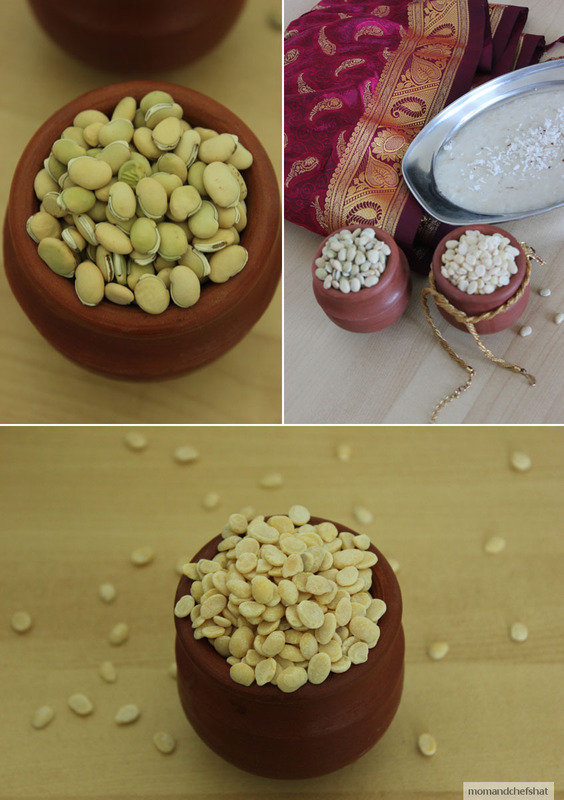 Cut vishu katta in desired pieces and serve with jaggery syrup. Jaggery syrup is made by heating desired amount of jaggery with water. 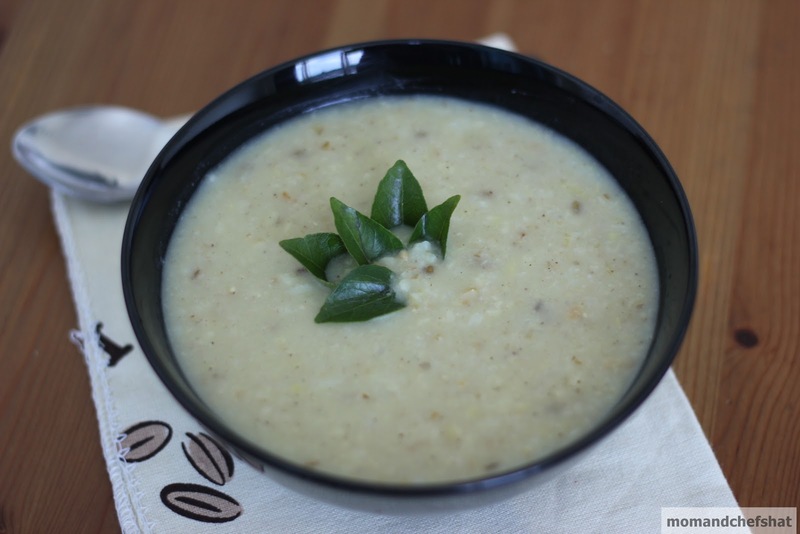 Allow it to thicken a little, but it should still have a liquid consistency so that you can enjoy it by pouring over vishu katta. Thin extract of coconut milk - 5 1/2 cups. 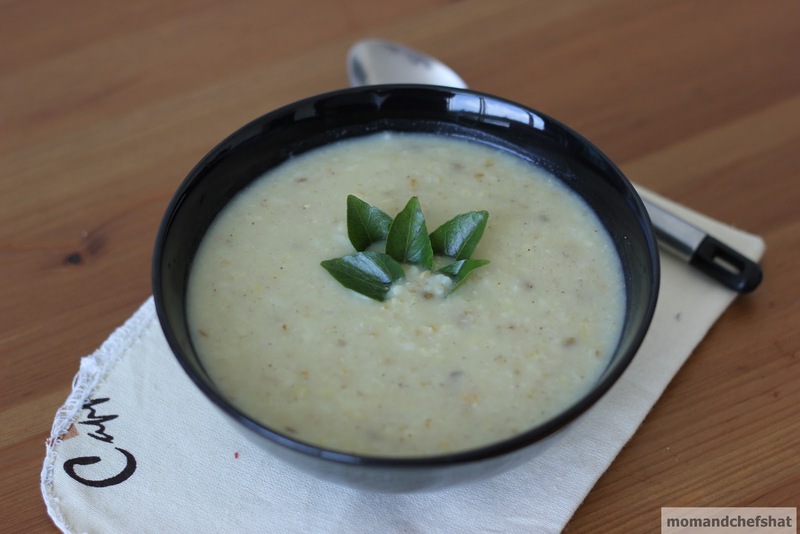 Mix 2 cups of thick coconut milk and 2 1/2 cups of water to make 51/2 cups of thin extract of coconut milk. 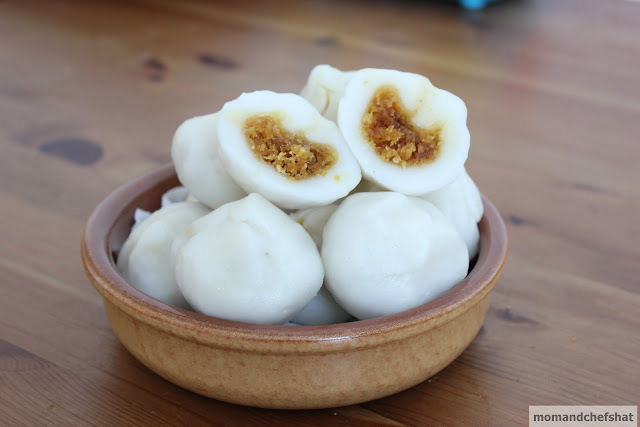 Mix rice flour, 5 1/2 cups of thin extract of coconut milk, salt, sugar, and cardamom powder to make a watery batter. Grease a steel plate with oil, pour this batter and sprinkle some chopped banana, and thick coconut milk of about 2 tbsp. Steam this for 15 minutes. 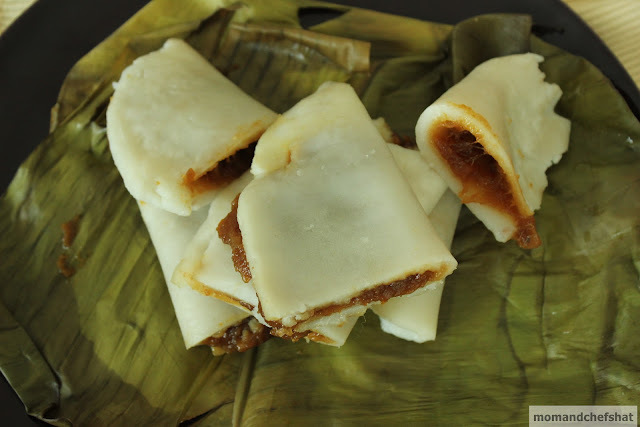 Remove appams from steamer, cut into bite size pieces and enjoy. 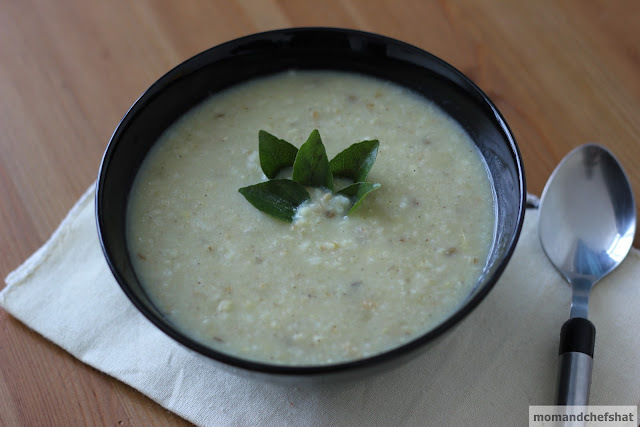 Continue steaming the remaining batter in batches, sprinkling chopped banana, and pouring 2 tbsp of thick coconut milk. You can use idli molds to make mini appams the same way shown below. 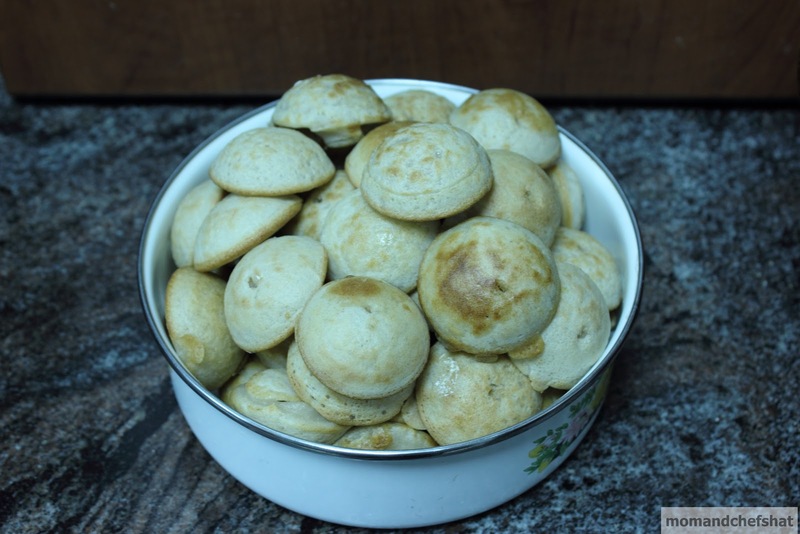 When you buy a uniyappam chatti, of course you make uniyappam (a popular snack from Kerala), then what with the uniyappam chatti, you make paniyaram, next in line could be these mutta aapams. 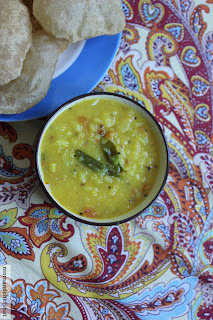 This is just a treat for people who are curry mad as mutta aappams pair well with almost all your favorite curries. 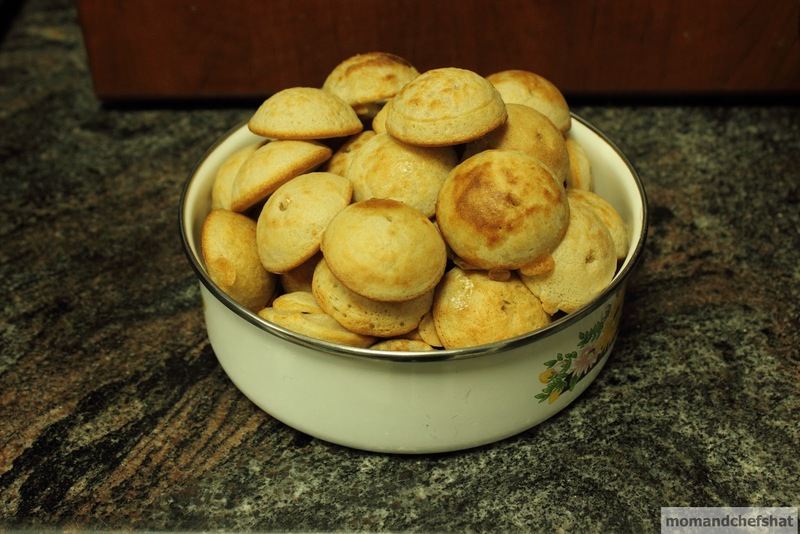 So what say about popping some curry drenched mutta aappams to your mouth. Small Banana/Cheru pazham - 1 No. Soak raw rice for 2 hours. 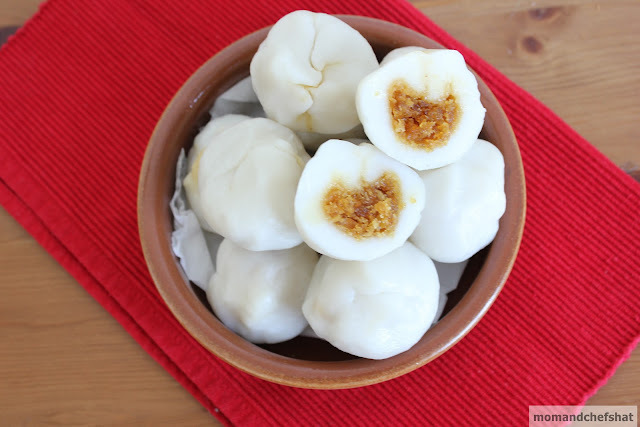 After 2 hours, put soaked rice in a blender along with cooked rice, egg, banana, and salt. 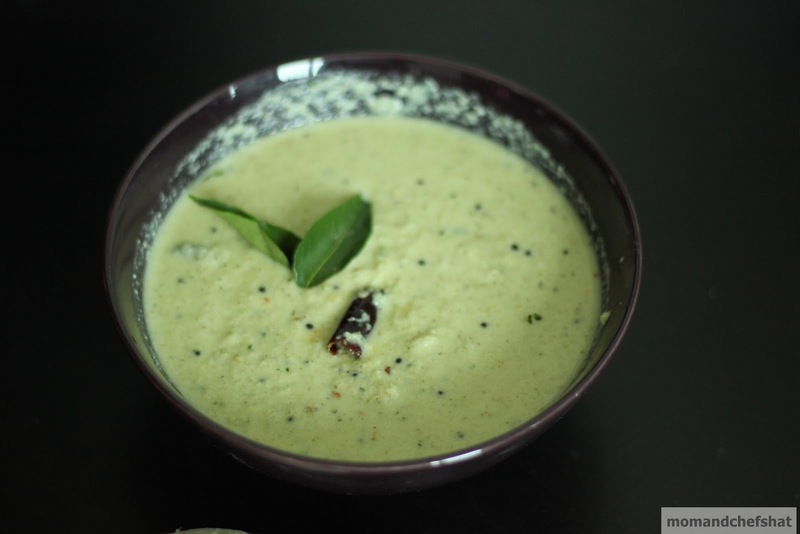 Grind this to the consistency of dosa batter (add water to retain the dosa batter consistency). Now add bicarbonate of soda and mix this well. Keep this aside. Heat nonstick unniyappam chatti and add a drop of oil in the hole, now pour the batter to the holes. Cook till it gives a light brown color on one side. Turn it to the other side and cook till it gets a light brown color. Serve this with beef curry, chicken fry, or duck fry. For the very Keralite in me, who loves chakka, manga, thenga, and vazhayila (Jackfruit, mango, coconuts, and banana leaf) and all things manglish. 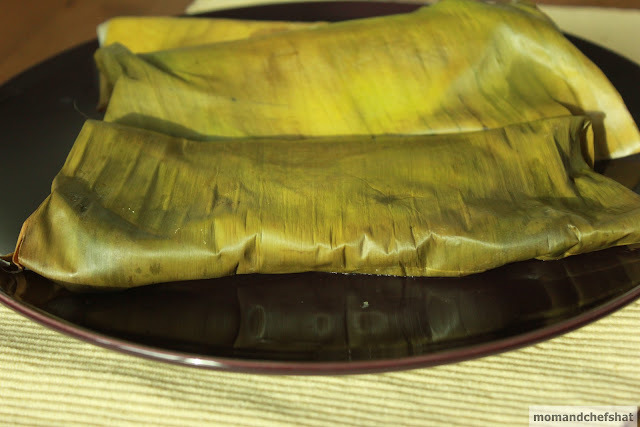 Ila Ada can be summarized as Kerala in a bowl with banana leaf, rice flour, and jackfruit preserve. 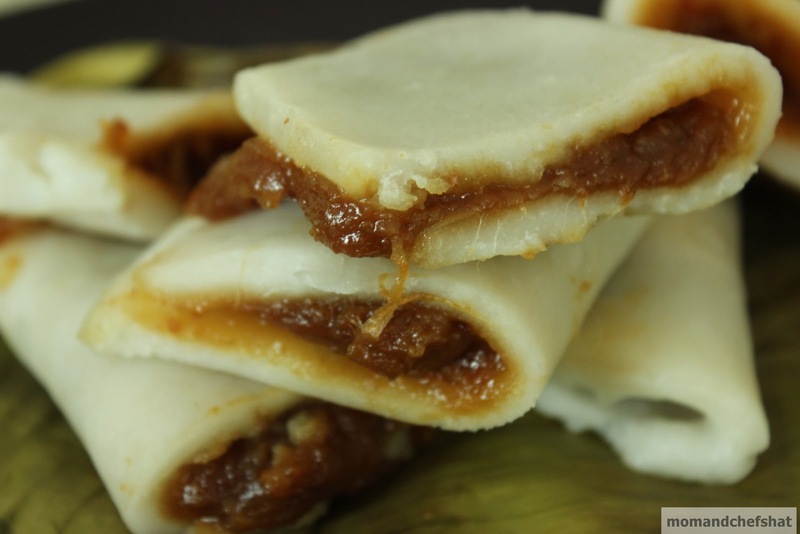 Let me make it easy, Ila Ada is a dumpling made of rice flour with some filling cooked in with the goodness of banana leaf. Eating it took me back home and I enjoyed basking in the memory of good old days when banana leaves and jackfruit were not foreign to us. 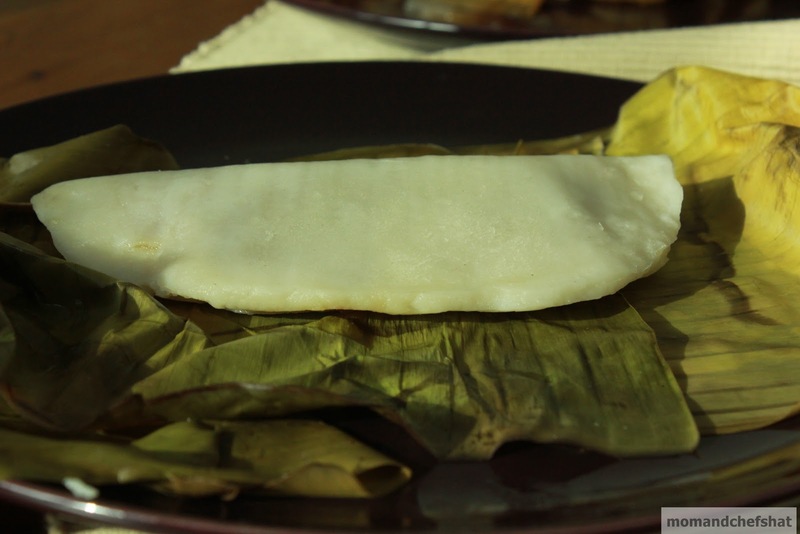 Here is the recipe for dumplings in banana leaf. In a pot, boil water. Add boiling water to the rice flour. Add some salt. Allow it to stand for a minute. When water is warm, you can start working on the dough with a spoon first and then with your hands. This results in a smooth dough. Now make balls out of the dough. 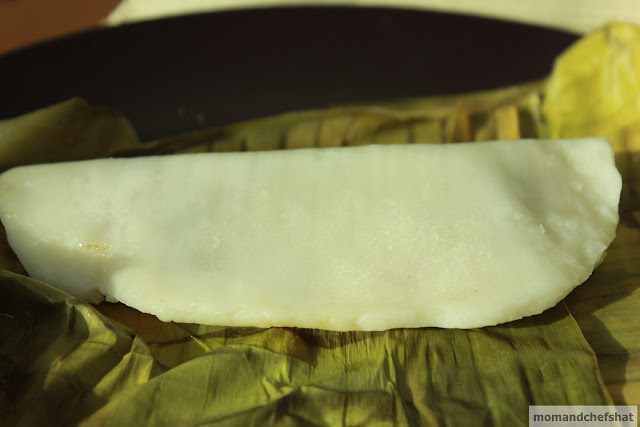 Take a clean banana leaf and flatten the dough to form a flat disc. 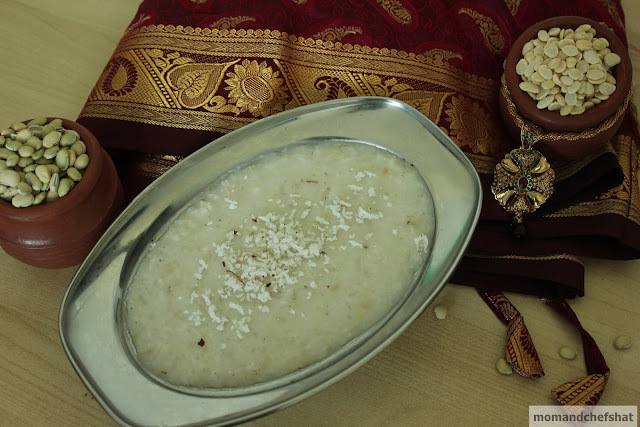 Now use chakka varatti as a filling and fold the ada along with the leaf. 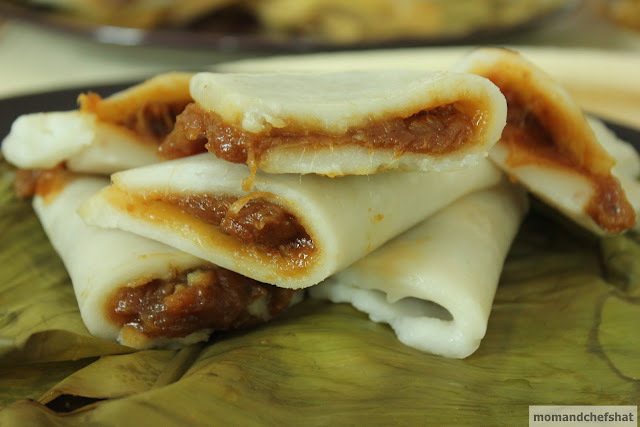 Continue the same process with the remaining dough, making balls, flattening the dough, and folding the banana leaf. Keep all the packed banana leaves nicely tucked in a steamer. 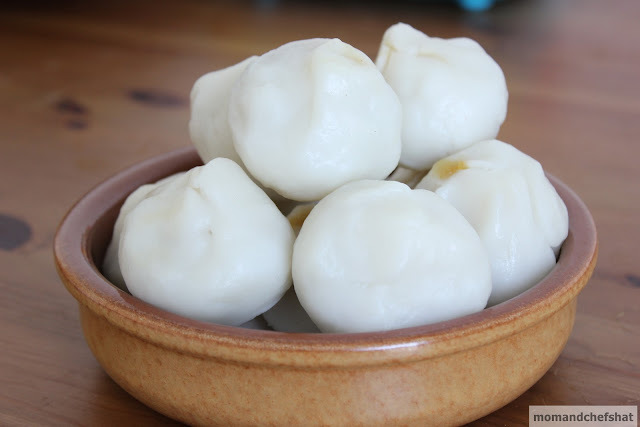 Using a steamer, cook this for 14-15 minutes. (The cooking time depends on how thick or thin you made the ada). When it is cooked, open the banana leaves, and serve the adas, fresh, hot or cold. Pearl onions - 3 Nos. 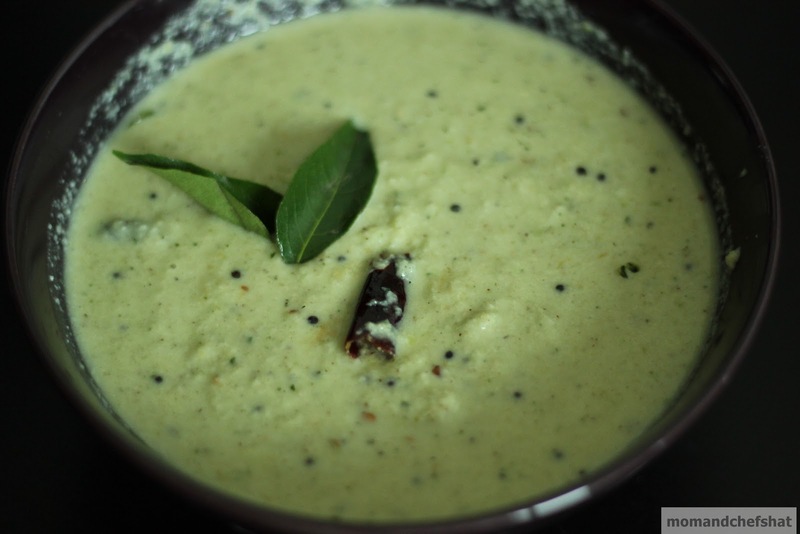 In a blender, grind grated coconut, ginger, curry leaves, green chillies, pearl onions, and pottukadalai. Keep this aside. Heat oil in a pan, splutter mustard seeds. Now add curry leaves and dry red chillies. Pour the paste which is set aside into this. Add water and salt if necessary. 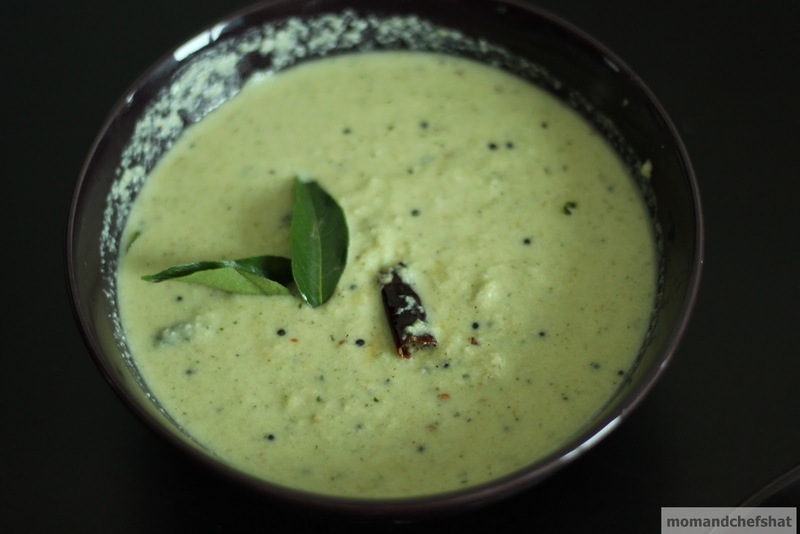 When the curry is about to boil, switch off the stove and serve hot with idlis, dosas. 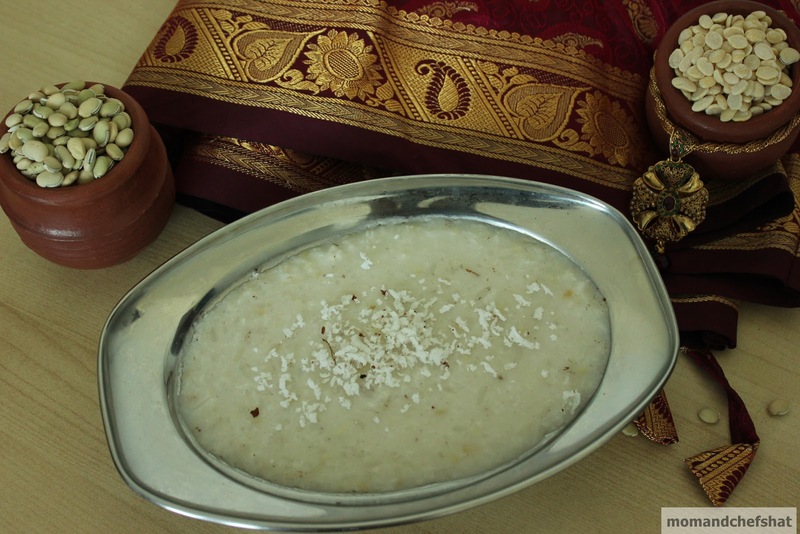 The one and only one Kanchipuram Saree I ever had was as exquisite as a Kanchipuram idli. Again, I am not complaining, I just stuck with one and only one as I was not fond of tying it. Kanchi Idli, which I made to my hearts content seemed like a subtle artwork to have a telltale behind them just like some expensive handwoven sarees lacking the sheen, and may have hundreds and thousands of stories to tell about its origins. 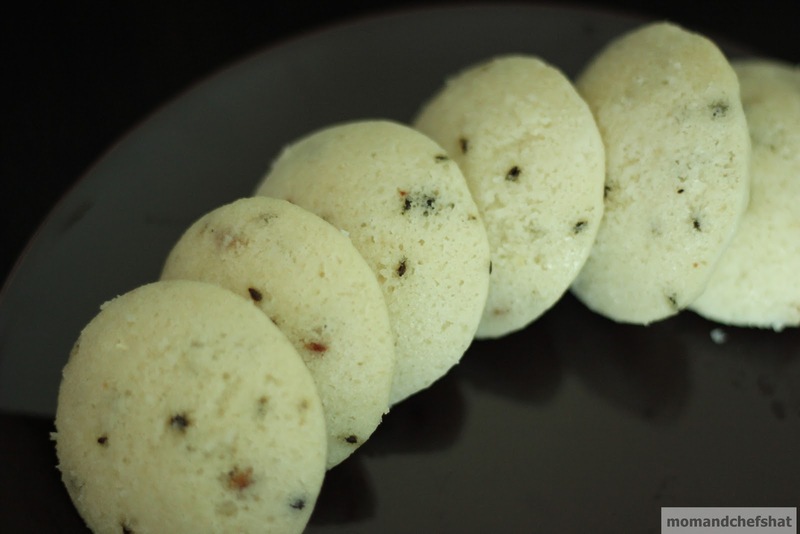 It tasted more like a steamed medhu vada, dotted with peppercorns and cumin. My understanding about Kanchipuram was limited to my roommate who finished her studies in Kanchi. According to her, Kanchi is worth a visit and one should not miss on the temples of Kanchi as it is fondly called City of 1000 temples. Now my own understanding was all about the sarees, which is hugely famous and occasionally tied just like Kanchipuram idlis are occasionally made in my home. 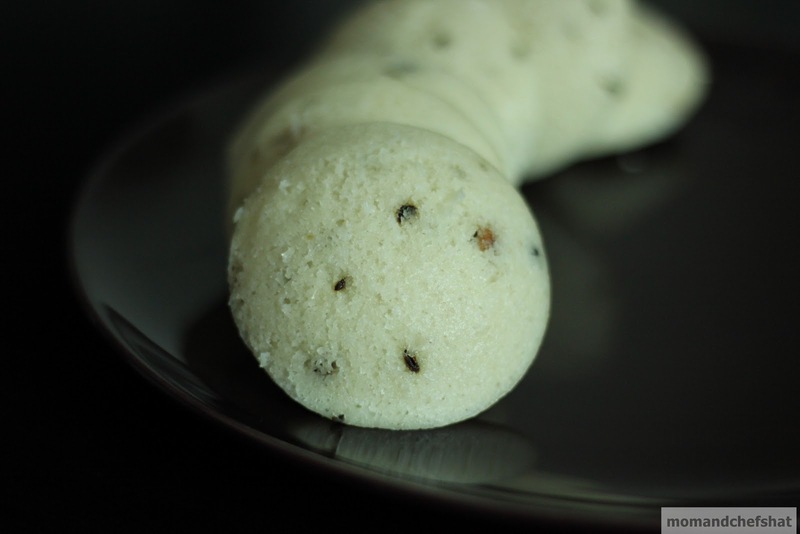 I even remember once mummy made this Kanchi idlis and the unappreciative kid in me gave her a what on earth look ………... During my term as a kid, even eating felt like a chore that was much alien to me. 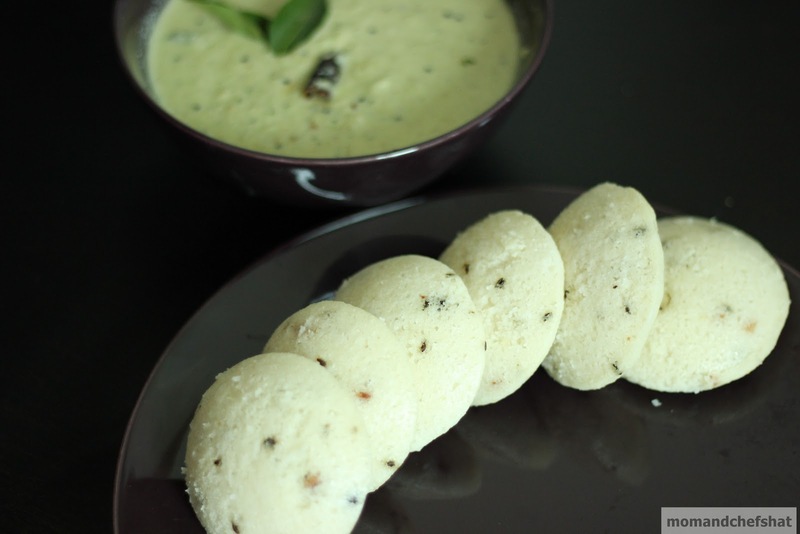 However, hesitant I was, idlis kept coming to our table every week. Needless to say, I fell for the routine. Let bygones be bygones. Now I am far from that struggling, fussy, unappreciative kid. 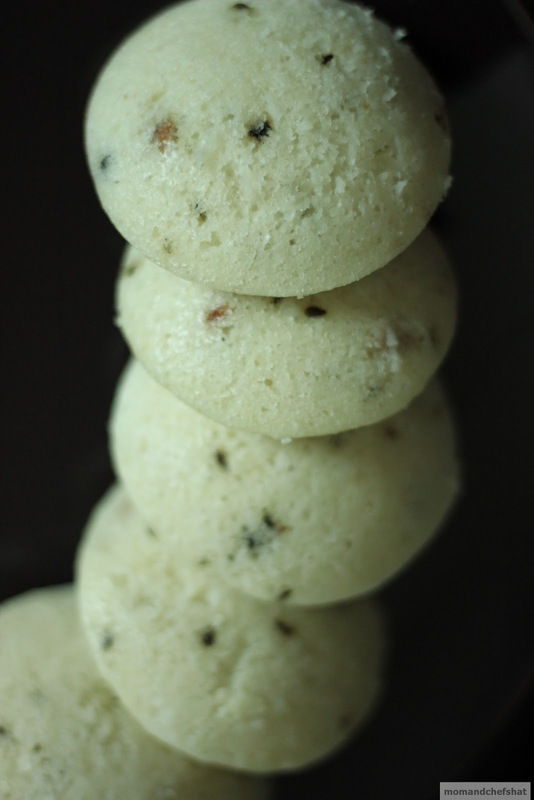 When I became a teenager, someone gave me the idea that eating idlis are not only healthy, but it can keep your skin intact, away from pimples. Also, by that time, highly experimental lady at home started making amazing Sambhars which kind of clicked my palate. So I am not quite sure if the love of idli started because of sambhar or the worry of me turning into a pimple prone girl. 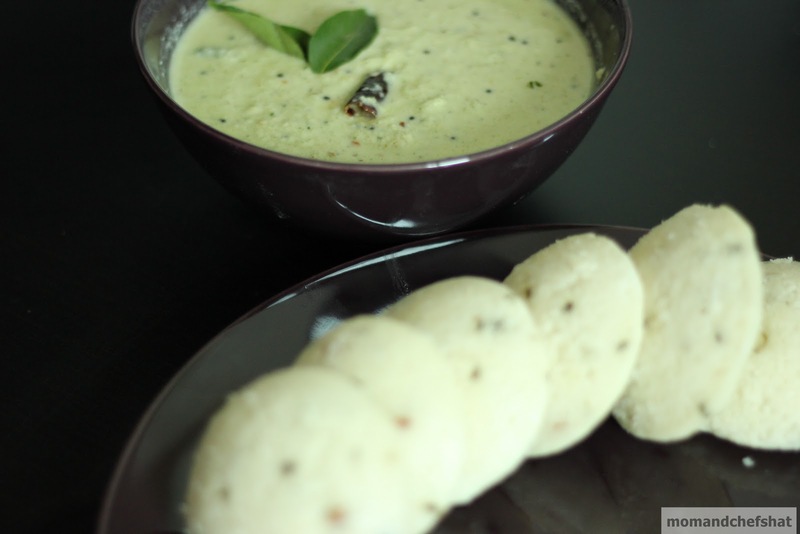 Now our weeks are not complete without steaming idlis and a small pot of sambar, though Abbey is not a big fan of idlis, I think she will slowly drift into the routine. Curry leaves, roughly chopped - 6 Nos. Soak rice in a bowl for 4-5 hours and grind them. 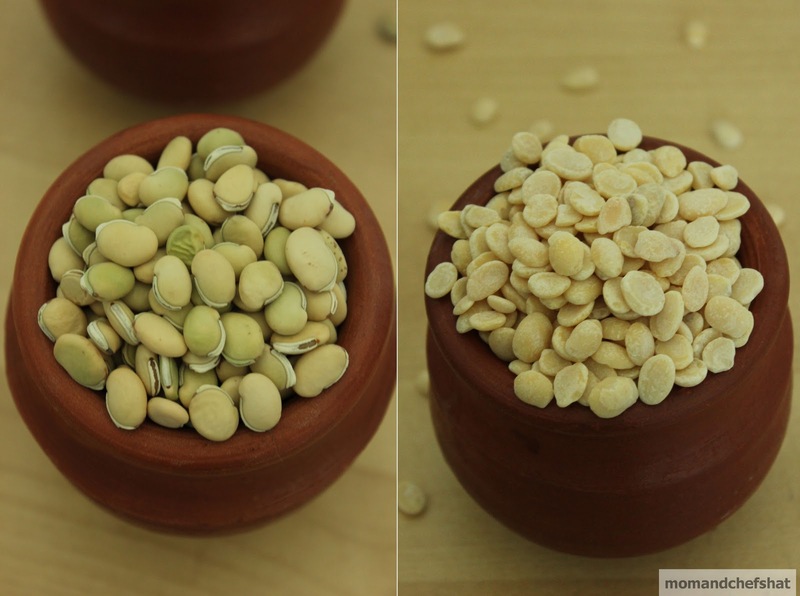 Soak urad dal and fenugreek seeds in another bowl for 4-5 hours and grind them. 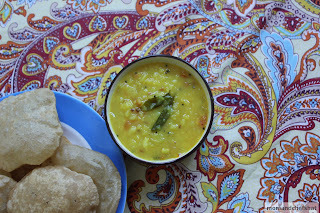 Now combine the batter of rice and urad dal. Add 2 tsp of salt into the batter and give it a nice stir. Let it ferment overnight. Heat 2 tsp oil in a pan, add the ingredients given under tempering. Pour this above the fermented batter, which has risen. Add curd. Add salt and a pinch of sodium bicarbonate if needed and give it a stir. 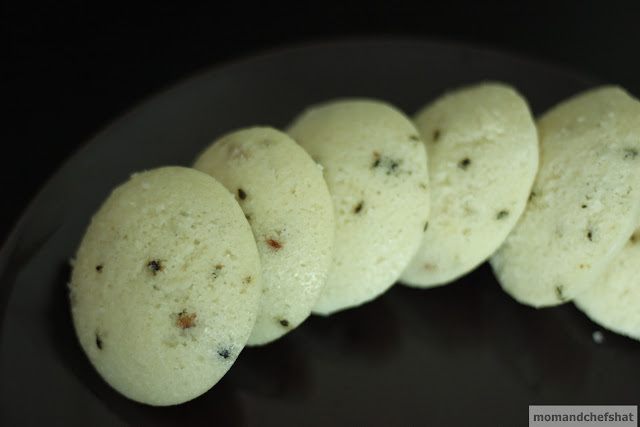 Pour the batter into the idli moulds and steam for 20 minutes (check in between if you are not sure).Remove the idlis and serve with coconut chutney. 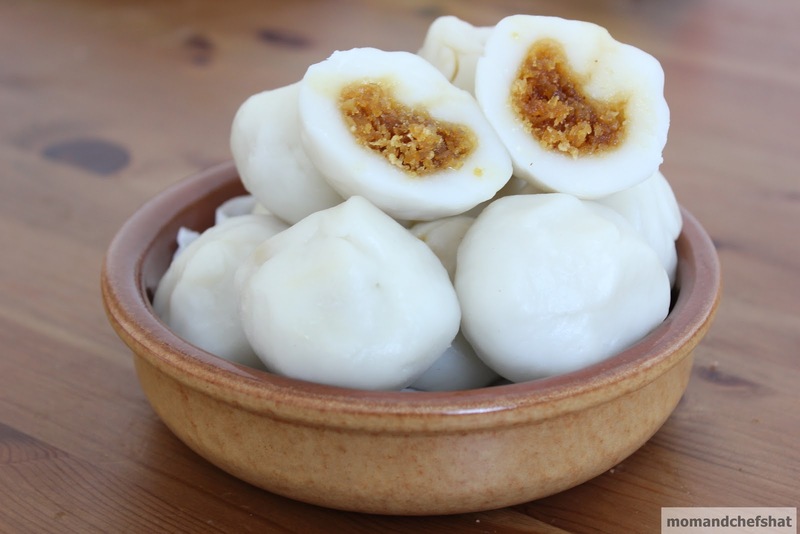 How to prepare the filling - Melt jaggery with 1/2 cup of water. Now pass this through a sieve to remove all the impurities. Now transfer the jaggery syrup to the stove and allow it to thicken. 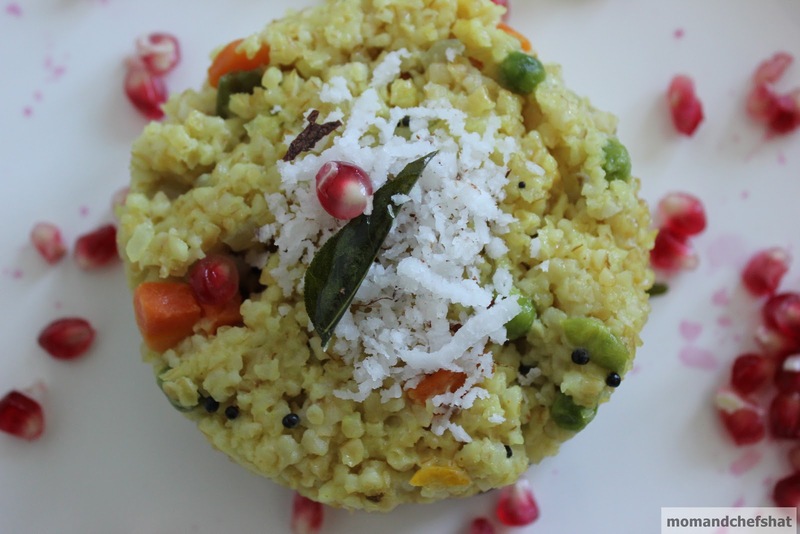 When it is about to reach a one-thread consistency, add grated coconut and cardamom powder. Mix well. (Mixture should be really thick and no water should remain, basically you say, varattuka). How to make the rice dumpling - In a pot, boil water. Add boiling water to the rice flour. Allow it to stand. When water is less hot, mix the water and flour thoroughly with your hands to make a smooth dough. Now make lemon sized balls out of the dough. Flatten the ball by pressing it with your fingers. Add the filling to it and make a pouch shape/cup shape of it (here you think about the pouch we use with a string on top) and close it on top. 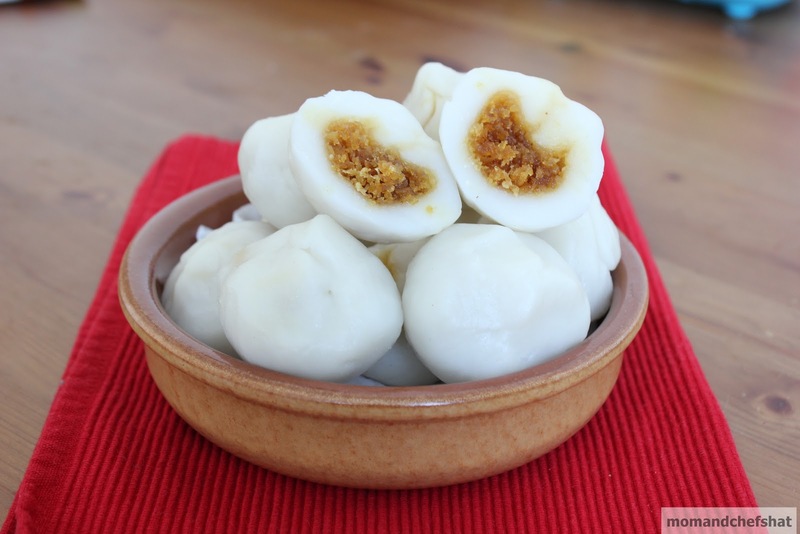 Using a steamer, steam the dumplings for about 15-17 minutes. 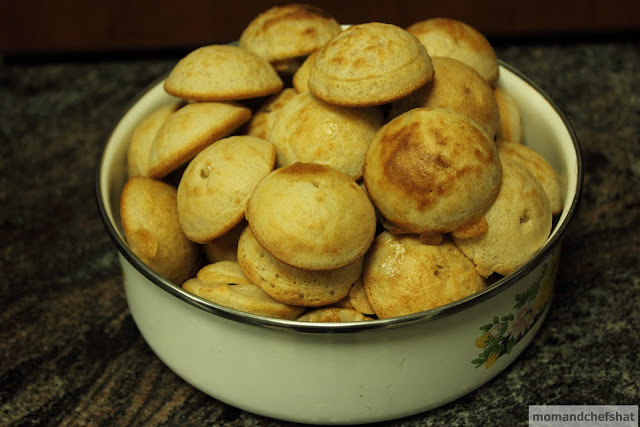 Mix wheat flour and salt with water and knead them to make soft dough. Shape the dough with hands to make balls. Roll them into rounds. Heat oil in a kadai, deep fry to get puffed light brown color pooris. Drain this onto a kitchen towel to absorb excess oil. 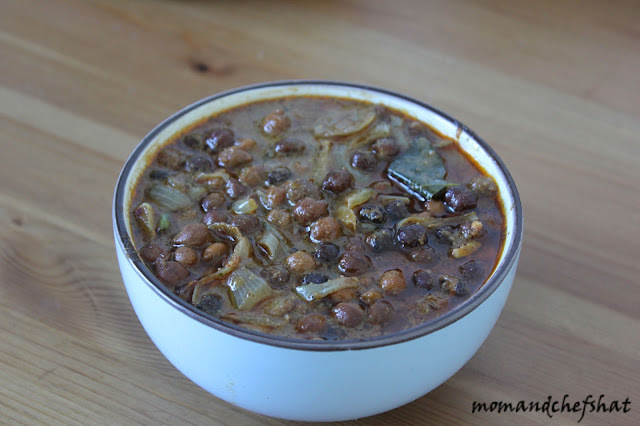 Serve hot with poori masala/bhaji. Clean the potatoes to remove any dirt, don't peel them. Pressure cook potatoes cutting them into half till 3-4 whistles. Open the pressure cooker, peel and mash the potatoes. 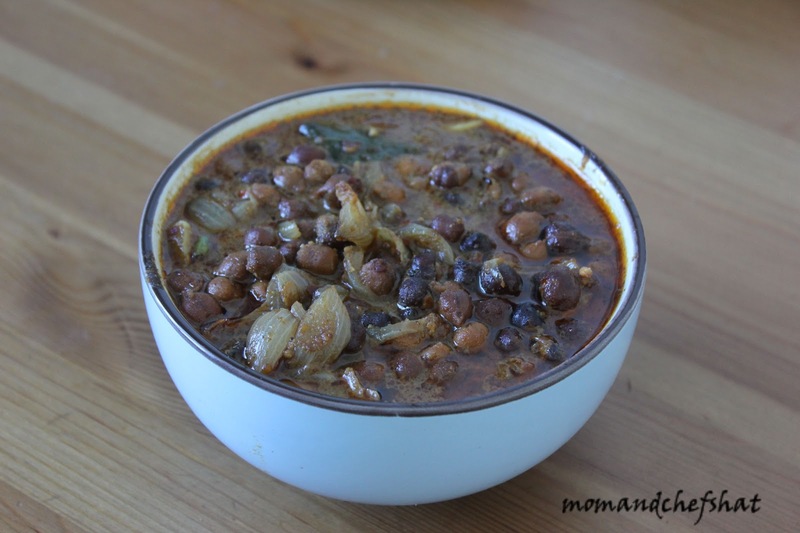 Heat oil in a pan, allow mustard seeds and urad dal to splutter. Saute onion, green chillies, and curry leaves. When onion turns transparent, add turmeric powder. Now add tomatoes chopped. When the tomatoes are sauteed (don't make them too mushy), add little water. When the curry starts to boil, add mashed potatoes and salt. 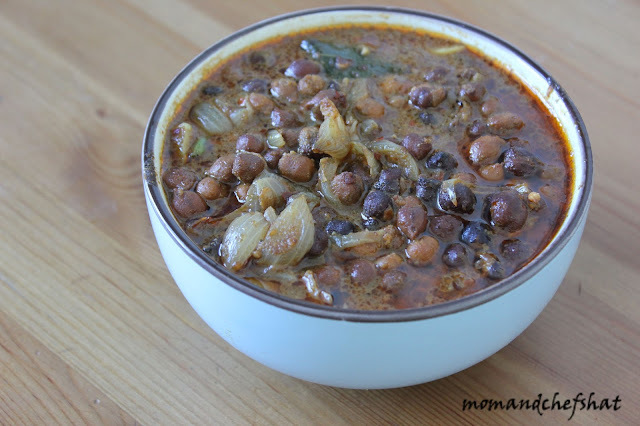 When the curry turns thick, switch off the stove. 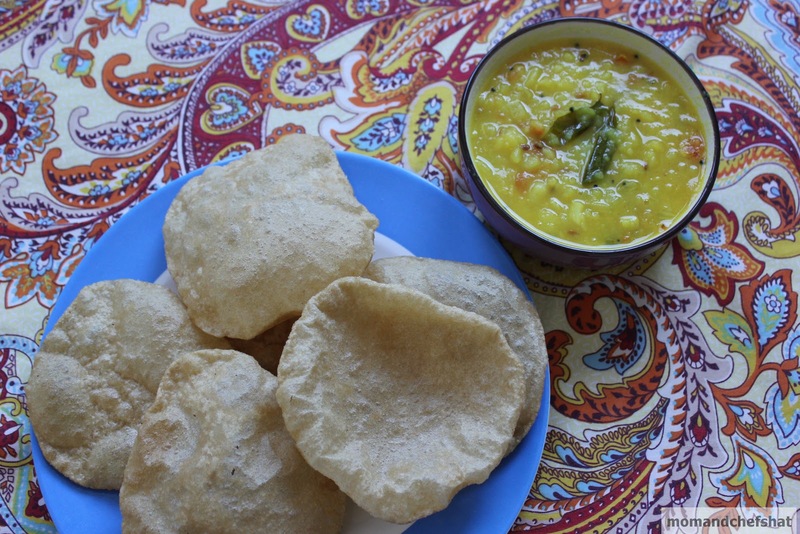 Serve hot with fluffy pooris. 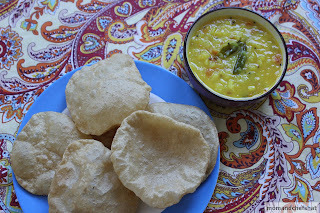 Note:- The consistency of poori masala can be changed by the addition or reduction of water. We were so into parties and travels; it seemed like fun, but now all I am left with is little-to-no health. It feels so different to be away from routine. Yeah, I know everyone needs to liven up oneself – refreshing and nourishing works to be done. But too much of anything is not good ......right fellas…..So after back-to-back travels and Abbey’s b’day parties, I feel I am not fitting into the niche of a homemaker. Oh my God! cupboards are all disorganized. Lots of cleaning and organizing to be done. Hope I will be back to square one soon. When home is not organized and less chi flowing, it is hard to think straight and right….I am short of ideas….Good Lord help me….Gail is in bed fast asleep. Well, new Mommie is trying to make life easy and I am afraid new mommie tag will be taken off soon as Gail is officially declared 2 and making excuses will be impossible from now on. 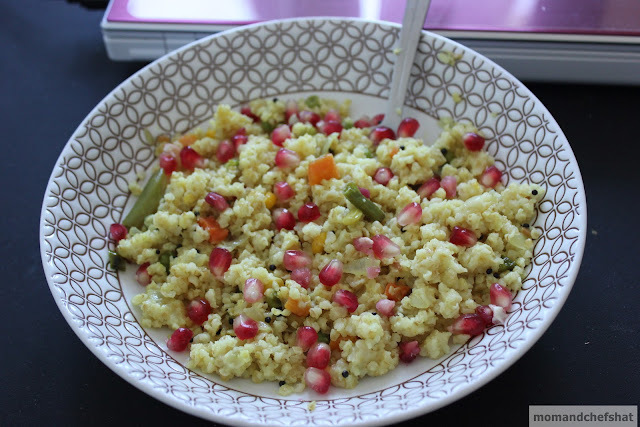 So back to kitchen for some easy peasy wheat upma. Pressure cook broken wheat/dalia till one whistle. Heat oil in a pan, crackle mustard seeds followed by urad dal. Saute onion, green chillies, and ginger. When the onion turns translucent, add frozen vegetables. Close the lid, lower the flame, and allow the steam to pass through the vegetables. (If you are using fresh veggies, give more time to cook). 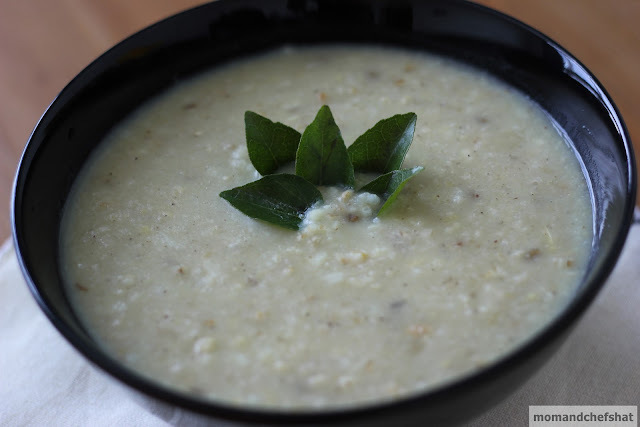 When the vegetables are cooked, add cracked wheat, which is already cooked. Mix well. Serve hot with a dollop of ghee, coriander leaves, and grated coconut. Add some pomegranate kernels if you have all the time in the world, believe me..... it tastes too good.